Until, that is, my 5th year living in Boston when we moved to an apartment in Jamaica Plain near a hole in the wall little bakery named Canto 6. A bakery with which we promptly fell in love. They make excellent sandwiches with fresh bread and homemade ingredients as well as soups and vegetable quiches and the occasional thin slice of pizza with chevre and olives. They make croissants that would hold their own in Paris, as well as meltingly tender scones, buttery Brioche topped with cheeses and honeys and fruits and other goodies, yogurt cakes, and olive rolls, and berry galettes, and sour cherry crumble pies. All of which are ridiculously high quality and delicious. Damn I miss that place. Of course, it can be dangerous to live near somewhere that bakes that many things that well. We conscientiously avoided developing a daily habit, but quickly fell into a routine of visiting each weekend, sometimes Saturday sometimes Sunday, to have a cup of coffee, lunch, and a treat. It took a long while before my eye was ever drawn away from the croissants, berry galette, or fruit brioche. So it was a long while before I bothered to try their salted chocolate chip cookie. But, one weekend we arrived later than usual for lunch and they were out of almost everything, so I chose one of the cookies. My eyes were opened with one bite. This, here, was a cookie worth writing home about. It was airy and crisp as a shell on the outside but uniformly tender and chewy within, contrasting with the snap of the edge of dark chocolate chunks here there and everywhere. The flavor wasn’t sweet but rather deeply honeyed and caramel, so deep it was almost spicy. And the outside was flecked with pinches of flaky salt, so every bite had salt to highlight and temper the sweet. They were really, really good. 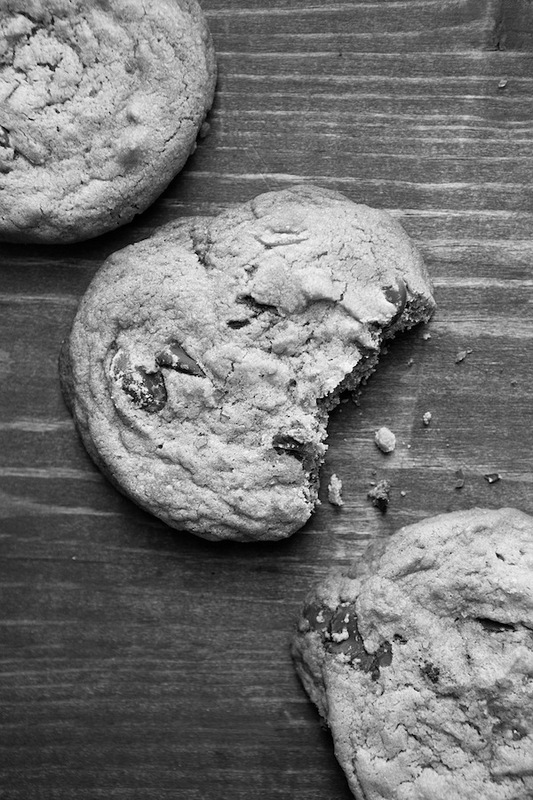 They were cookies I wanted to eat, that I thought about fondly from time to time during the week, unlike any of the chocolate chip cookies I’d ever been given before, and unlike almost any cookie you make at home. I bought the Bouchon Bakery Cookbook a couple of weeks ago, after reading the comments of its reviewers on Food52‘s piglet tournament of the cookbooks. They said that, even beyond being a book whose every recipe was delicious, it was a book that would transform your understanding of baking with its compulsive attention to detail and technique. This is no surprise whatsoever, given it is a book by Thomas Keller and his chief pastry chef and bread baker from Bouchon Bakery. If ever there was a set of people for whom perfectionism in cooking is a religion, these are they. It makes many of their recipes fussy and borderline (if not completely) ridiculous. But, it also teaches you as you use it and results in recipes that work just as they say they will. I bought the book because I have decided that one of these days I’m going to conquer homemade croissants. Just as a fun challenge. And, I figured if anyone could teach me to make magnificent croissants in my own kitchen, it would be Thomas Keller et al. But, I’m saving that for another day. The first recipe I wound up trying was their chocolate chip and chunk cookies. Joel, you see, does get definite chocolate chip cookie cravings, and was having one the very day I received the book. So, we spent the evening baking. After we took the cookies, gorgeously spread, attractively cracked and bronzed, from the oven and allowed them to cool, we tried them out, and there they were! A truly worthy specimen of chocolate cookie, with that wondrous interplay of textures and nuanced flavors. These were kissing cousins of the chocolate chip cookies that made me think maybe chocolate chip cookies were worth eating now and then. These are the cookies I served one of to each of our guests the other week at our dinner party, and deemed that dessert enough. And it absolutely was. Something that I love about these cookies, beyond the wonderful flavor and texture that I’ve already mentioned, is that they are interesting and quality enough that you really only need one, eaten slowly and attentively, to be content. Plus they freeze beautifully, so you can take the remainder of the batch (which is nice and small to begin with) and freeze them, so you can enjoy them one at a time on several other nights over the next month or two. Which, personally, I think is the best way to savor cookies anyway. Put the flour in a medium bowl and sift in the baking soda. Whisk in the salt. In a small bowl, stir together the dark brown sugar, granulated sugar, and molasses, breaking up any lumps. The mixture will not be smooth, just be sure any big lumps are broken up. Put the butter in the bowl of a stand mixer fitted with the paddle attachment. Cream the butter at medium-low speed until it is the consistency of mayonnaise and holds a peak when the paddles is lifted. Add the molasses mixture and mix for 3 to 4 minutes, until fluffy. Scrape down the sides and bottom of the bowl. Add the egg and mix on low speed for 15-30 seconds, until just combined. The mixture will probably look broken, and will not be smooth. This is fine. You don’t want to overwhip the eggs because this causes the cookies to expand too much during baking and then deflate, leading to imperfect texture (isn’t that interesting?? I had no idea.). Scrape down the sides of the bowl again. Add the dry ingredients in two additions, mixing on low speed for 15-30 seconds after each, until just combined. Scrape down the sides and the bottom of the bowl to incorporate any stray dry ingredients that haven’t gotten mixed in (some always seem to stick in the bottom of the bowl just out of the paddle’s reach, so this is an important step!). Add the chocolate and pulse on low speed 10 times to combine. Cover and refrigerate the dough for 30 minutes. Meanwhile, heat your oven to 325F, being sure to position the racks in the upper and lower thirds of the oven. Line two baking sheets with parchment paper. To make super giant bakery-style cookies, divide the dough into 6 equal pieces. To make more normal sized, but still nice and generous, cookies, divide the dough into 12 equal pieces. Roll each piece into a ball, break the ball in half and smoosh the two halves together with the rough broken sides facing up, to give what will be the surface of the cookie a nice texture. (Or, if that is totally confusing because I didn’t get a chance to take pictures of the process, just roll the pieces and know they’ll be fine just like that.) Put half of the cookies on each pan. Sprinkle each of the cookies with a pinch of salt. Bake the cookies until golden brown, 18-20 minutes for the large size of cookie, 16-18 minutes for the smaller size. (I always err on the lower side of baking time and take the cookies out when they’re almost not quite done in the center. I think this gives them the best texture). Let the cookies cool on the pan for 5-10 minutes then transfer them to a cooling rack to cool completely. Now, I know you’re going to think I’m nuts, but I’m going to recommend you don’t eat the cookies warm. 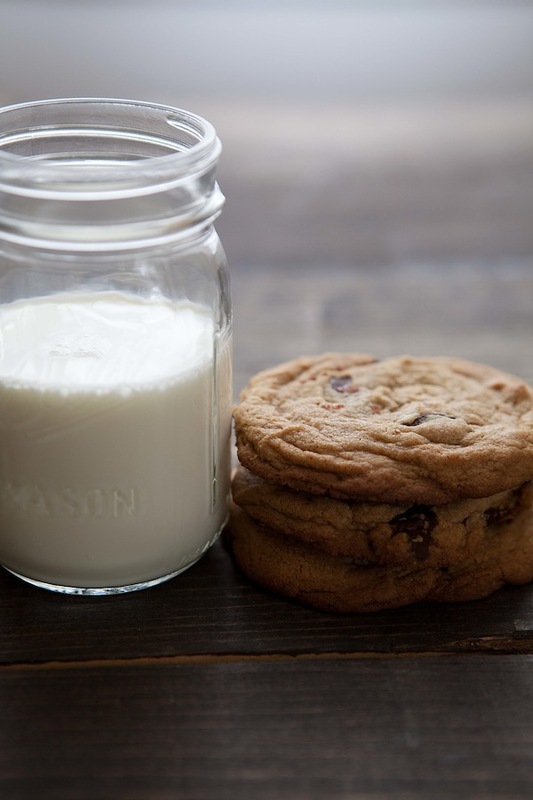 I know this seems like sacrilege, but I’ve discovered that all the very best chocolate chip cookies taste their best when they’ve been allowed to cool completely as this give the flavors time to settle and mingle and the texture to really come into its own. 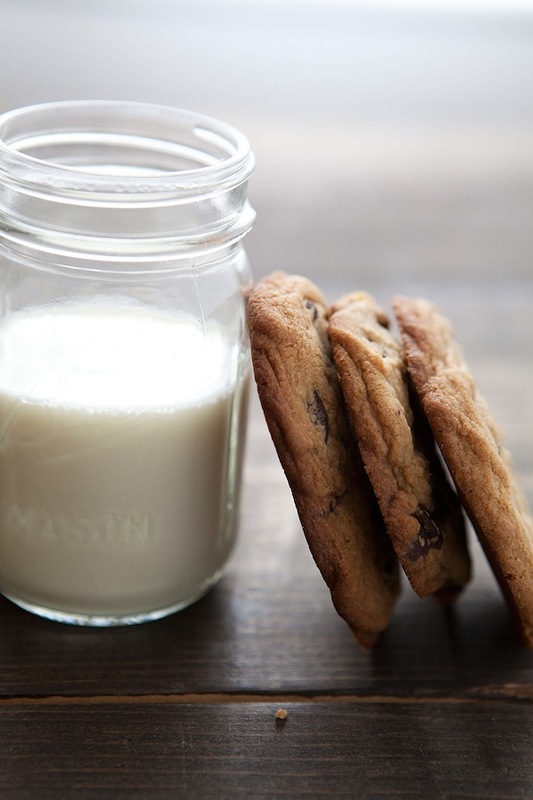 Eating cookies while warm and soft allows the melted chocolate to completely dominant, along with a doughy flavor that in really good cookies often tastes unbalanced. Less good cookies tend to taste the best warm and gooey because the melty chocolate and soft texture covers up for other problems with the flavor and texture, and these kinds of cookies are often super sweet, which is less perceptible when they’re warm because of the way your mouth gets coated with the goo. So, in the end, it’s your choice, but my advice is to let these guys cool fully. Enjoy the cookies slowly, one at a time. They freeze quite well, so you can eat one each and freeze the rest to break out one at a time on other days. Hi Emily, that sounds just like the kind of cookie recipe I’ve been looking for for years!! I’ve just printed it off and will try them ASAP. Not sure where I’ll get the molasses from, but will see…. I hope they meet with your approval. The molasses really impacts the texture more so than the flavor, so I hope you can find it, though I do imagine they’d still be pretty good if you used the standard vanilla extract instead. I think that most chocolate cookie recipes often produce what are more similar to store-bought, prepackaged chocolate cookies of the type that toddlers get given – completely unacceptable in my opinion. The perfect chocolate chip cookie recipe is a very hard nut to crack and, even though I got pretty close this Christmas time, I will try these and hope to be met by a choir of angels as I take my first bite. 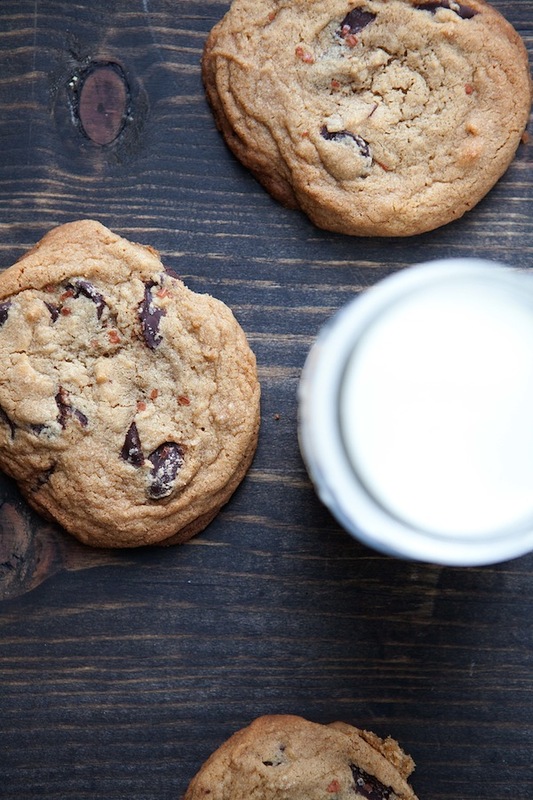 A perfect chocolate chip cookie really is one of the best things in life, along with freshly baked bread and butter or a warm croissant (obviously). I hope you hear choirs too, though they may not be quite that that perfect. I totally agree with you about most chocolate cookie recipes as well as about freshly baked bread and croissant, obviously :). Did you ever try the chocolate chip cookies at Clearflour Bread in Brookline? Also eye-opening delicious. Ridiculous, ridiculous. You know, I tried a whole bunch of things from Clearflour (and they were all amazing), but I don’t think I ever tried the chocolate chip cookie! Now I know what to get next time I’m back in Boston for a visit. Looks lovely! I also was part of the healthy after school snack club! My sweet tooth has swollen up these past few weeks and I couldn’t be happier someone so passionate about cookies (Bouchon Bakery cookies, no less). I agree that Keller’s books can enlighten many a folk. I admit with much shame that I have three of his books and I’ve only but flipped through them. Thanks for the great read- I look forward to following you. I do hope you try cooking from them some time! It is definitely a bit of a commitment, but now and then when you have time, it’s a great experience, and the food always turns out beautiful as well. I love Bouchon Bakery and The French Laundry. The last time I was in Napa, my brother and I stopped at Bouchon Bakery and I got a dozen macarons of all different kinds of flavors…they were amazing! These cookies sound amazing as well and I’m so excited you shared this recipe. I saw in the comments above that someone was asking where to buy molasses – I get it in a jar at my local grocery store near the baking stuff. Just made these as walnut ginger cookies. Amazing. Especially like the small amount of leavener which makes these denser with an amazing fudgier centre. Thanks for sharing this fantastic recipe!! Wow! The walnut ginger addition sounds wonderful! You are currently reading Bouchon Bakery chocolate chip cookies at Five And Spice.